This is the name retrospectively given to the gathering of Christian clerics at the double monastery of Streaneshalch (Bay of the Beacon), located above the town now known as Whitby in 664 AD/CE. The main points discussed were what should be the date of Easter and the “right” clerical tonsure for Christians. These were two outward signs of the differences between, what can be termed, the ‘Celtic’ church and the ‘Roman’ church. The reason why the Roman church won the debate affected all other Christian practises in Britain from that time forward. The modern calculation of the Easter date is that it falls on the first Sunday after the first ecclesiastical full moon after 20th March (vernal equinox): “Astronomy is absolutely at the heart of setting the date for Easter. It depends on two astronomical things – the spring equinox and the full moon”. (Dr. Marek Kukula, Royal Observatory Greenwich) The first full moon after the vernal equinox was called “14 Nisan” which Christian sources said was the Passover date. Modern Jewish sources refer to 15 Nisan as their Pesach (or Passover) but their day starts on the evening before. Apparently the calculation of the Easter date has never been done by simple observation, possibly due to potential cloud cover (?) and the need to co-ordinate the celebrations for churches in different areas. So tables were drawn up from very early times to predict 14 Nisan. At the Council of Nicea, in 325 AD/CE, it is said they settled the Paschal celebration date though not the method of calculation. Yet it did not generally settle the date for Easter for the church. The church in Rome and the church in Alexandria continued to celebrate Easter on different days as their methods for calculating the Easter date were different. The scientific method used for calculating the date is referred to as a “computus”. The Roman and Alexandrine methods of calculating Easter only fully came together in the 6th century when Dionysius Exiguus used the Alexandrine computus and converted it into the solar calendar for his Easter tables issued in 525 AD/CE. The difficulties in the calculations for Easter are due to the fact that the lunar year (by which the day of 14 Nisan is calculated) does not exactly correspond to the length of the solar year we use for the calendar. The Christian missionary Augustine had arrived in Kent from Rome in 597 AD/CE, whilst Irish Christian missionary Aidan had worked in Northumbria between 635 and 651 AD/CE. This meant that, along with the gospel, the customs and traditions of Roman Christianity were being introduced in the south east of Britain whilst the customs and traditions of the Celtic Christianity were being introduced into the north and north east of Britain. King Oswy (Oswiu) had been taught and baptised by the Irish. However his second wife, Eanfled, was from Kent and followed Roman Christianity as did Alchfrid, Oswy’s son, who was the sub-king of Deira. • 14 Nisan (first full moon) is the Passover. • The Passover has to be after the vernal equinox. • The Christian Paschal feast, Easter, should be held on a Sunday only. However, “the devil’s in the detail”. There were two differing points of practice between the Celtic and Roman Christians at Whitby. When the vernal or spring equinox was deemed to take place: for the Celts the equinox fell on March 25th whilst for the Rome loyalists it fell on March 21st. Which Sunday was appropriate for the Easter celebration: They actually agreed on the date for most years but there was a difference every 6 years or so. The Celts understood that the tradition they followed was that taught by the apostle John and they calculated Easter day as falling between 14 Nisan and 20 Nisan – i.e. When the 14 Nisan (the Passover) fell on a Sunday, they celebrated it on that day. But if it fell on the day after (on Monday) then the Easter celebration would fall on the following Sunday (20 Nisan), etc. The Rome loyalists claimed the authority of the apostle Peter, and calculated Easter Day as falling between 15 Nisan and 21 Nisan. So when the date of 15 Nisan through to the 20 Nisan fell on a Sunday, and the full moon had fallen after March 25th, both Celtic and Roman Christians would celebrate Easter on the same day. It was when the Celts celebrated on 14 Nisan itself on Sunday that one main difference came, as the Rome loyalists then celebrated Easter a week later on 21 Nisan instead. 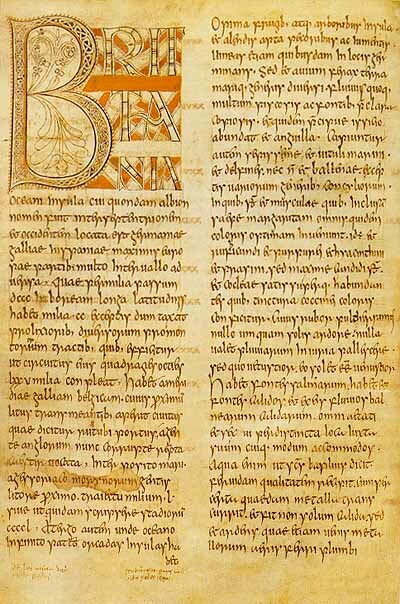 This explains the situation described by the Venerable Bede: “Thus it is said to have happened in those times that Easter was twice kept in one year; and that when the king having ended the time of fasting, kept his Easter, the queen and her followers were still fasting, and celebrating Palm Sunday”. In that particular year 14 Nisan had fallen on a Sunday. A bigger difference would occur occasionally when the full moon fell between March 21 and March 24th as the Celts would then calculate 14 Nisan as being in a later month to the Roman calculation and the Celts would celebrate Easter about a month later than Rome loyalists in that particular year. This meant that at the Northumbrian court, which was Christian, the most important Christian festival was celebrated on two different dates, by different members of the court, in some years. This did not cause any problems whilst Aidan of Lindisfarne was alive, as Christians of both the Irish and the Roman Christian traditions respected the holy man, but he died in 651 AD/CE. This sporadic divergence in the celebration of Easter eventually started to cause comments after that. 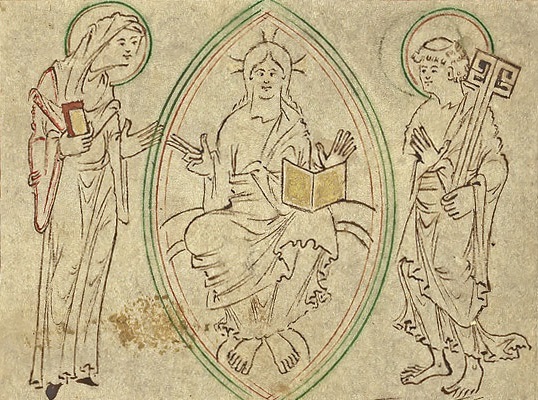 In order to obtain a unified date for Easter for all Christians in Britain to follow, King Oswy called a witan to decide which the correct Christian tradition to follow was. His son, King Alchfrid, also attended. King Oswy opened the proceedings by saying that as all followed one God, all should follow the same rule of life so this gathering was to find out which was the truest tradition so all could follow that tradition. Those called on, to represent the different traditions to the king, were Colman, an Irish cleric and the bishop of Lindisfarne, for the Celtic tradition and Agilbert, a Frankish cleric. Agilbert asked for Wilfrid, abbot of the Ripon monastery to speak on his behalf. Oswy then instructed Colman to start it off by explaining the customs he followed and where it originated from. Colman said that he had learnt it from the elders of the church and their forefathers, beloved of God, and it originated from Saint John the Evangelist, the disciple beloved of God. Wilfrid went into great detail to demolish each of Colman’s points, such as saying John had followed Jewish law to avoid scandalising the Jews amongst the Christian community. One important point was that the full moon on the 14th had to happen on the Saturday evening before Easter Sunday for the Rome loyalists. The Celts were happy to celebrate on the 14th Nisan if the full moon started during the day on that Sunday. Wilfrid then stated that “…the command being to keep the Passover from the fourteenth moon of the first month in the evening to the twenty-first moon of the same month in the evening” and he further claimed John’s successors in Asia had followed this custom. 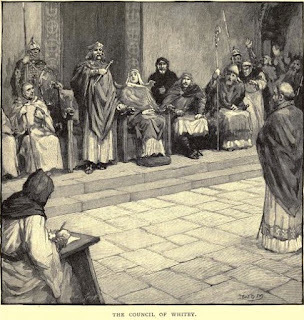 Wilfrid also claimed that this rule had been confirmed at the Council of Nicea. Green, in his article “The Northumbrian Cross”, dryly noted Wilfrid was being a bit economical with the truth here. Wilfrid then pointed out that the Celtic church was not really following the customs of John as John had followed Jewish law and celebrated the Passover whatever day it fell on. But the Celtic church celebrated Easter on a Sunday yet were not celebrating it according to the customs of the apostle Peter. Wilfrid briefly got rude about Saint Columba but quickly retracted it by saying he wasn’t really saying that about Colman’s fathers in the church. Wilfrid then claimed the supremacy of the apostle Peter over the authority of John by mentioning the scripture where Jesus gave Peter the key to the kingdom. This last point obviously struck home to King Oswy and became the crucial point in his final decision. But Oswy carefully checked this point out with Colman before giving that decision. Oswy said he did not wish to make an enemy of the man (Saint Peter) who held the keys to heaven and decided in favour of the Roman tradition. So this decision was not merely about the method of calculating Easter but it also acknowledged the primacy of Rome over all Christians within the Northumbrian kingdom. All those present had originally agreed to follow his decision. Unfortunately bishop Colman felt he could not follow the Roman tradition and left Lindisfarne for Iona. King Oswy obviously still felt great respect for Colman as he appointed Eata to be abbot of Lindisfarne at Colman’s request.